There are many options available when it comes to creating custom water features, ponds, watergardens, etc. Some people are interested in having us build streams with waterfalls to meander throughout their front yard or backyard. At Outdoor Magic, we are expert waterfall and stream installers, and ensure that each and every job blends seamlessly into a client’s existing landscape for an all-natural look and feel. 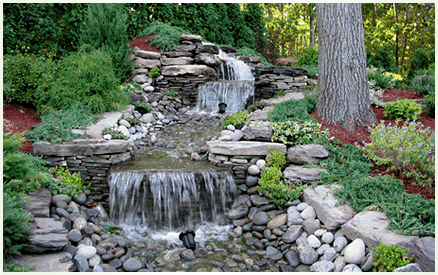 We create picture perfect streams with cascading waterfalls in your yard by using a combination of river rocks, large stones, plants, grasses and more. Take a look at our portfolio gallery to view some of the streams and waterfalls we’ve built. When you’re ready, call us at (845) 398-2116 to discuss your custom backyard landscape incorporating flowing streams and waterfalls.